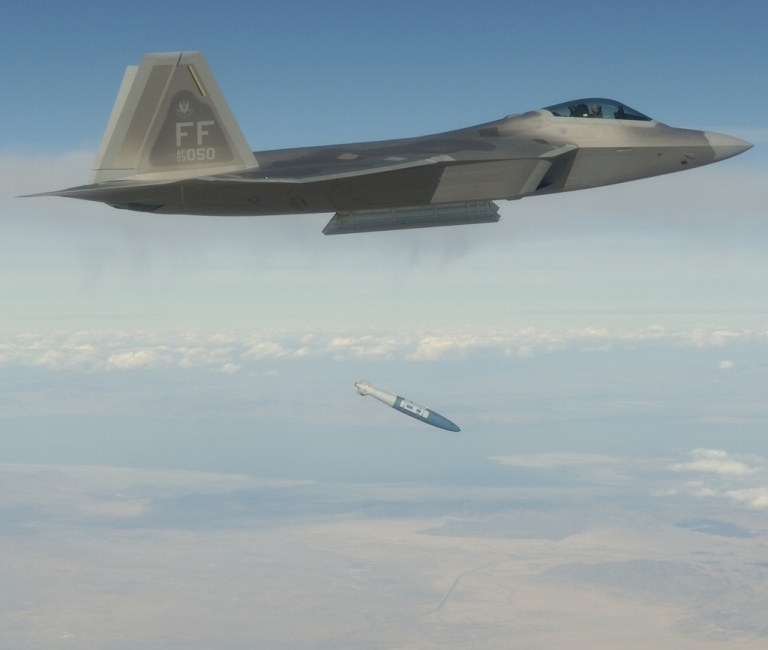 F-22A Raptor assigned to the 27th Fighter Squadron of the 1st Fighter Wing, Langley, Virginia, the first operational unit to fly the F-22A, releasing a GBU-32 JDAM satellite/inertial smart bomb. The US Air Force intends to replace the F-117A Nighthawk stealth fighter with the F-22A providing a precision strike capability against the most heavily defended targets. Two F-22A squadrons are to be assigned to the 49th Fighter Wing at Holloman, New Mexico, replacing all existing dedicated F-117A strike aircraft. 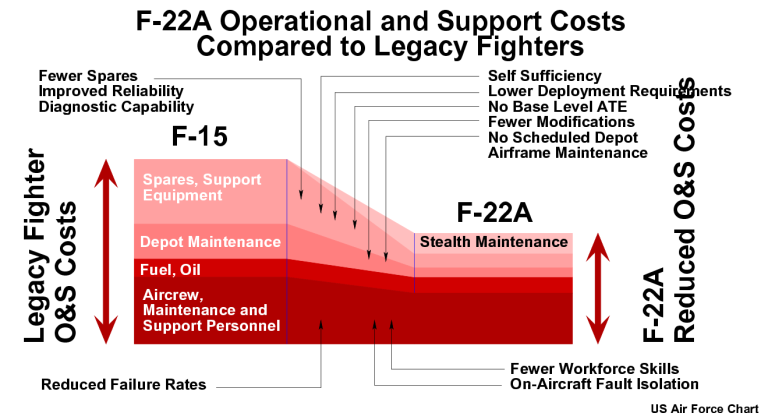 Since the F-22A was conceived during the 1980s, its basic role has expanded considerably. Early production F-22As will be used both as a penetrating strike fighter and air combat fighter, and medium term planning envisages an Intelligence Surveillance Reconnaissance role, Suppression of Enemy Air Defence role, and an Electronic Attack derivative. (US Air Force). The Lockheed-Martin F-22A Raptor is without doubt the most capable multirole combat aircraft in production today, and the only design which combines all aspect wideband stealth capability, supersonic cruise capability, high supersonic and subsonic agility and a fully integrated avionic suite. It also has the dubious distinction of being the most maligned combat aircraft design since the 1960s TFX – its critics in the US and elsewhere concocting untruthful stories about its capabilities, utility and cost. With the F-22A having recently transitioned from Low Rate Initial Production to full rate production, and with Initial Operational Capability declared twelve months ago, it’is timely to explore the F-22A in detail. This analysis is an updated and expanded version of the original 2005 analysis. Today's F-22A has its earliest origins in the Advanced Tactical Fighter (ATF) program, conceived during the late seventies and early eighties in response to intelligence reports on the then new Soviet Ramenskoye Ram-L and Ram-K prototypes, which eventually evolved into today's Su-27/30 and MiG-29 family of aircraft. The Sukhoi and MiG fighters were designed around the aerodynamic, propulsion and tactical ideas which were central to the US teen-series F-14, F-15, F-16 and F/A-18A fighters: highly agile 'energy fighters' capable of sustaining high instantaneous and sustained transonic turn rates, with high thrust-to-weight ratios and thus specific excess power to permit rapid acceleration and then exceptional climb performance. Close combat capabilities were matched with Mach 2+ supersonic dash performance for air defence intercept roles, plus a large pulse Doppler radar to permit Beyond Visual Range (BVR) shots against opposing fighters and incoming cruise missiles. There is little doubt that the US fighters were almost unbeatable in comparison with the sixties and seventies technology Soviet fighters they were built to kill: the MiG-21 Fishbed, MiG-23/27 Flogger, Su-15/21 Flagon and widely used earlier Soviet types. This was no longer true of the Su-27 and MiG-29 - their TsAAGI developed aerodynamic configuration fused key ideas from the F-14, F-15 and F-16 designs into a single package, which in a single design matched all of the best qualities of the teen-series types. In effect, the MiG-29 and especially the Su-27 were a half-generation beyond the US fighters in aerodynamic design. With BVR combat capabilities matching or exceeding the teen series, the Soviets were a full generation ahead in close in combat capabilities through the introduction of the R-73 (AA-11 Archer) Gen 4 missile and the Shchel series helmet mounted sights. In short, with the Su-27 the Soviets created a superior fighter. US Air Force thinking was to develop a successor to the F-15 family of fighters that would restore a capability margin over the new Su-27 and MiG-29 series. The new Advanced Tactical Fighter was to outperform the new Soviet designs in BVR and close combat, and have the energy performance advantage to engage and disengage at will. It was envisaged that the new ATFs would penetrate high and fast, deep into Soviet held airspace to defeat PVO and VVS fighters over their own ground, and thus enable strike aircraft to demolish Soviet ground-based air defences and defended assets. The technological enabler for this revolutionary change in energy performance was the supercooled turbine, developed by the US Air Force and contractors in a long running program. A turbofan with a supercooled turbine could sustain much higher inlet gas temperatures, permitting the engine to develop much higher dry thrust at altitude and thus sustain Mach 1.4 plus speeds without using the thirsty afterburner. 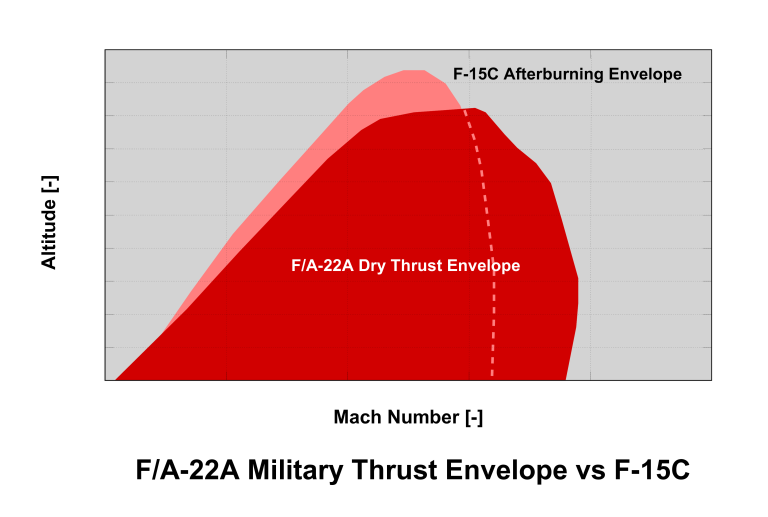 Supersonic cruise or “Supercruise” would thus permit the ATF to operate in the teen/teenski series fighters' afterburning performance envelope in dry thrust alone, providing not only unprecedented supersonic persistence, but also exceptional supersonic and subsonic agility (later manifested in the use of thrust vectoring). 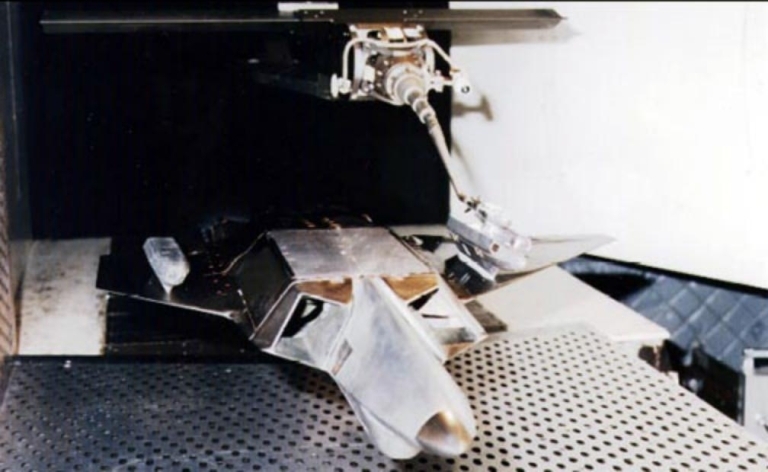 The second key technology to find its way into the ATF was stealth, with the success of the Have Blue and F-117A demonstrating its utility. With stealth, the ATF could have an unbeatable advantage in BVR combat, and F-117A-like survivability against surface to air missile threats. The third key technology to be introduced into the ATF was an integrated software-centric digital avionic suite, in which all sensor and system processing was concentrated in a redundant package of multi-processing computers. The ATF's sensor suite was to be dominated by a large active phased array radar, built for low antenna radar signature, and with the agility and processing power to provide Low Probability of Intercept modes. The RFP was issued in 1986. The resulting Lockheed/Boeing/General Dynamics YF-22A and Northrop/McDonnell-Douglas YF-23A demonstrators embodied these key design concepts. Early in 1991, the more conservative YF-22A was selected over the more radical (and arguably riskier) YF-23A, resulting in today's F-22A. Early planning envisaged envisaged up to 750 ATFs being built, as one-for-one replacements for the expected fleet of F-15A and F-15C fighters. The year the F-22A development program was launched was the year in which the Soviet Union collapsed, and the year in which the F-117A demolished the nucleus of Saddam's air defence system. 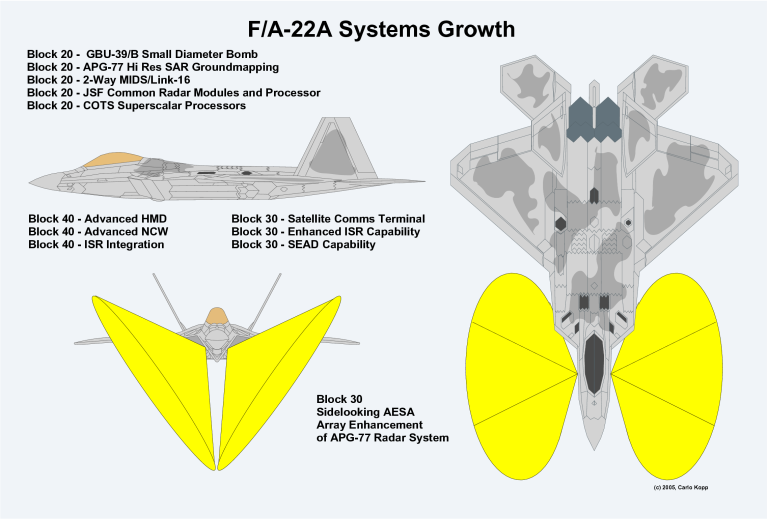 While the production F-22A design was being crafted, exploiting the conceptual design of the YF-22A, much thought was being invested in the changing strategic environment. Clearly an F-22A designed for NATO theatre air superiority alone would be too narrowly specialised for a post Cold War world, one in which a post Soviet Russia was busily proliferating the Su-27 and S-300PMU and S-300V surface to air missile systems. The new globalised world was going to be a 'rainbow threat' environment, with evolved variants of top tier Soviet systems available globally. Indeed, the world we see today is exactly this, with Asian operators expected to exceed total numbers of Russian operated Su-27 and S-300 series weapon systems, and cruise missiles a high volume product. By the mid 1990s the F-22A was firmly reoriented as a multirole fighter, intended to not only demolish opposing fighter assets and supporting AWACS, but also hunt mobile and semimobile S-300 batteries, supporting command centres and other critical surface targets. The success and the limitations of the F-117A Nighthawk were clearly apparent in 1991, and the supercruising high altitude F-22A was clearly the only aircraft that could go where it was becoming unsafe to send an F-117A. There can be no doubt that the Raptor will remain unmatched in capabilities and combined stealth/aerodynamic performance for decades to come. The number of new technologies used in its design compares only to the radical break seen in the 1960s TFX program, and only comparable investment in developing analogous technologies can produce an equivalent design in the EU or Russia. The Raptor seems destined to remain in a league of its own for decades to come. Maj. John Teichert, USAF, of the 411th Flight Test Squadron performs the first supersonic release of the 1,000 lb GBU-32 Joint Direct Attack Munition over the Mojave test range, on the 14th July, 2005 (US Air Force). Internal weapon bay carriage of the JDAM and AMRAAM (USAF Photo). Fit check of the GBU-39/B Small Diameter Bomb (USAF Photo). The F-22A's APG-77 multimode radar is the most capable currently in existence, combining AESA technology with Low Probability of Intercept modes, and unmatched power output. Early full rate production aircraft will be receiving an upgraded COTS technology radar processor and lower cost TR modules, using technology common to the JSF, and high resolution Synthetic Aperture Radar mapping modes (Author). By any measure, the development of the F-22A was revolutionary - in the technology employed and from a stealth design point standpoint - and this produced a combat aircraft that has no equal. Being able to carry weapons internally was essential to its stealth capability, and efficient supercruise. 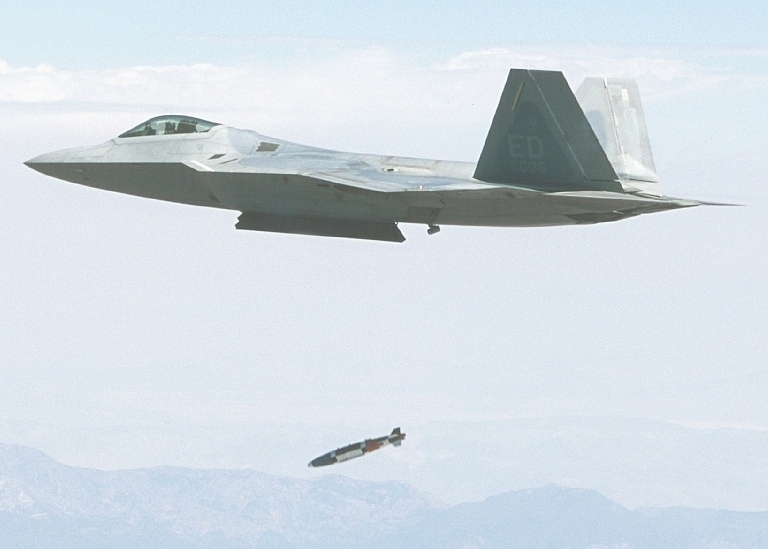 Given the role away from dedicated air superiority, rather than incur the costs of resizing the compact main internal bays of the F-22A, sized initially around four early AIM-120A AMRAAMs, the US Air Force embarked on the 'Small Smart Bomb' program centred on the idea of carrying a payload of multiple 250 lb class bombs. 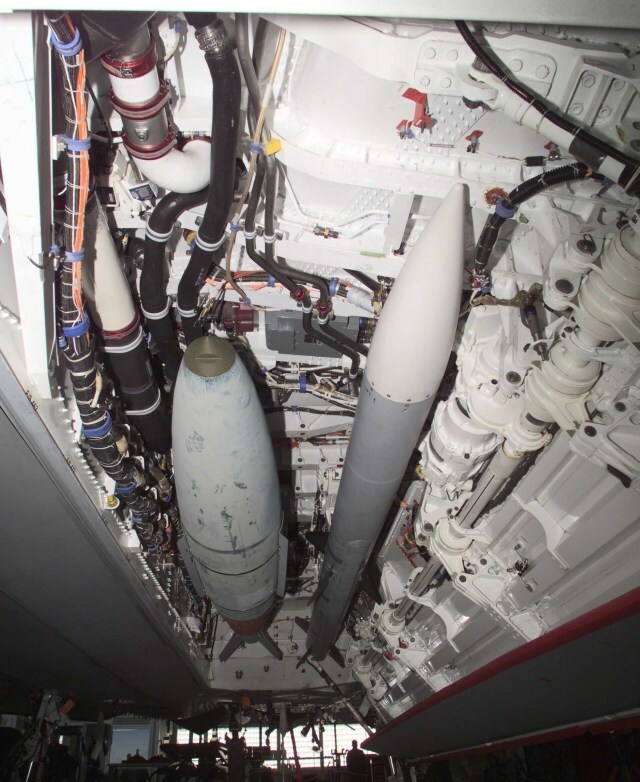 Today's 385 lb GBU-39/B and GBU-40/B Small Diameter Bombs (SDB) were sized around the F-22A weapon bay. 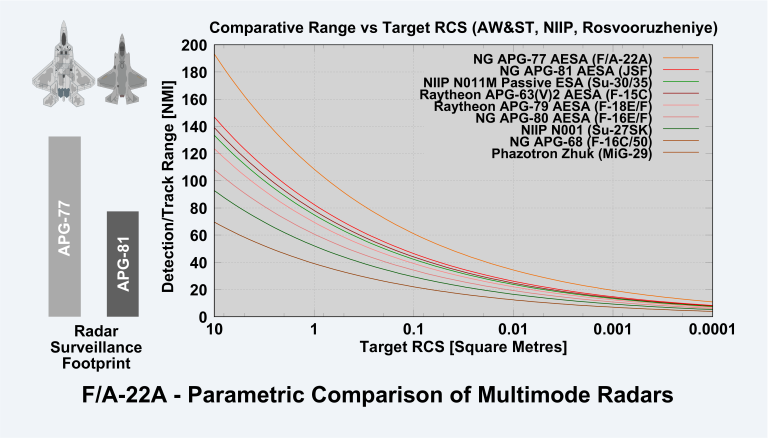 For the intended role of busting an opponent's airfields, mobile missile batteries, and command posts, the mix of either two GBU-32 1,000 lb JDAMs or eight GBU-39/40 SDBs is an excellent fit. With all-aspect stealth and penetrating supersonic at 50,000 ft AGL, the F-22A remains virtually unstoppable by surface-to-air missiles or fighters. It is likely that operational F-22As will be used far more frequently to break down an opponent's air defences than in the classical air superiority role, despite the aircraft retaining the full air superiority capabilities envisaged for the ATF. The 1990s saw the production configuration of the F-22A refined, with a new fuselage shape, revised larger span wing planform, smaller vertical tails positioned aft, relocated cockpit, and production configuration avionics architected. Stealth shaping for the F-22A design was unique as it used edge-aligned inlets and thrust-vectoring nozzles, by virtue of edge length capable of defeating radars with greater wavelengths than any other stealthy fighter inlet and nozzle designs in existence. Built thus for all-aspect relatively wideband stealth, this is a distinct optimisation for deep-penetration and air combat, and the most capable stealth design other than the specialised F-117A and B-2A. The raw aerodynamic performance of the F-22A was without precedent. In military (dry) thrust setting the F-22A could cover the whole afterburning performance envelope of the F-15 - or advanced Sukhois, both still the highest performing energy fighters widely deployed. The F-22A was rated for 9G at combat weights. With 20,650 lb of internal fuel, the F-22A internally carried 88 per cent of the fuel in a CFT-equipped F-15E, with no drag penalty, yet with four 592 USG drop tanks, a total fuel load of 36,515 lb could be carried, 6 per cent more than the internal fuel of the larger F-111. 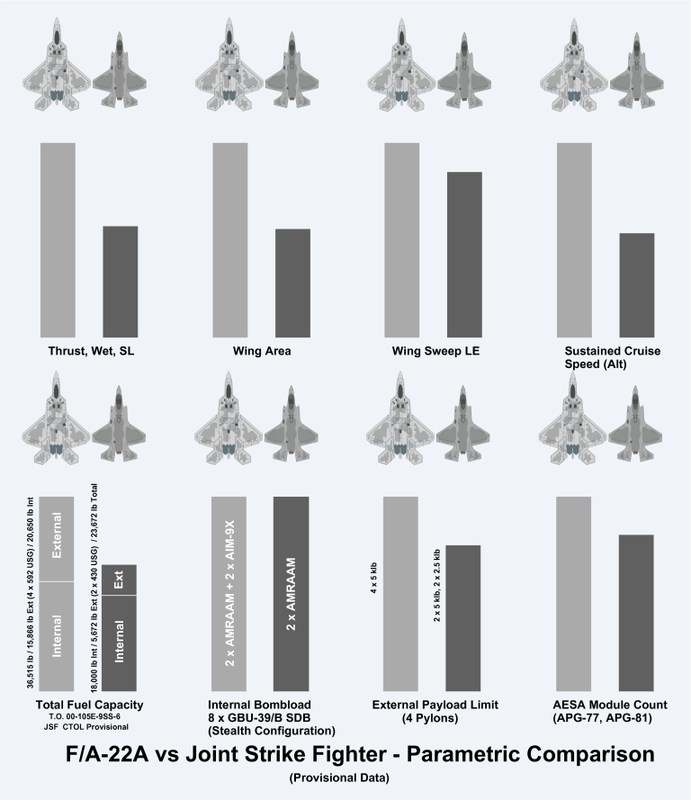 This uncalibrated chart compares the speed/altitude envelope of the F-22A in military power (dry) thrust rating against the F-15C in afterburning (maximum) thrust rating. The combination of F119-PW-100 supercruising engine and optimised supersonic aerodynamics results in a revolutionary advance in performance, evidenced by repeated one vs many engagements against F-15Cs during Opeval going to the F-22A (US Air Force / Author). Refined supersonic aerodynamics allowed the F-22A to exceed Mach 1.5 in military thrust at altitude - the exact top speed in dry thrust has never been disclosed. In early trials, F-15 chase aircraft could not keep up, and test pilots soon reported instances where even modest heading changes by F-22A prototypes in head-to-head engagement geometries caused opposing teen series fighters to abort engagements entirely - an experience historically seen only in engagements against Foxbats and Foxhounds. The unchallenged aerodynamic performance of the F-22A design required considerable design innovation, and extensive use of new materials techniques. At nearly 40 per cent of total empty weight, the F-22A had the highest fraction of Titanium alloy in any US design since the SR-71A, which compares closely to the Russian Sukhois. Resin Transfer Molded (RTM) thermoset composites, specifically epoxy and high temperature bismaleimide (BMI) composites, made up 24 per cent of total empty weight. New processes, such as Hot Isostatic Pressed (HIP) casting and vacuum chamber electron beam welding were introduced to allow complex high strength shapes to be fabricated from Titanium alloys, primarily Ti-64 and Ti-62222, minimising the number of fasteners used. Only 16 per cent of the F-22A's empty weight comprised Aluminium alloys. Like the B-2A, geometrical accuracy is critical to stealth performance, and the F-22A required similar production tolerancing. The F119-PW-100 supercruising thrust-vectoring engine proved no less challenging. The 'short and fat' F119 engine was built with integrally bladed rotors, using high strength long chord fan and compressor blades, floatwall combustors exploiting high Cobalt content alloys. Heat resistant Titanium Alloy C was used extensively in compressor stators, the afterburner and nozzles. The part count in the F119 was reduced by 40 per cent against the earlier F100/F110 engines to improve reliability and maintainability. Extensive self diagnostic capabilities were incorporated to reduce personnel and test equipment demands on deployment by 50 per cent against the F-15. The F119-PW-100 is typically cited in the 35,000 lb static SL thrust class. The nozzles provide 20-degree deflection, used for manouevre and for supersonic cruise trim drag reduction. An Airframe Mounted Accessory Drive (AMAD) is used to couple engine power to generators, hydraulic pumps and shaft power to the engines from the Air Turbine Starter System (ATSS). Unlike earlier designs, the F-22A introduced a digital Vehicle Management System (VMS), which integrates primary flight controls, leading edge flap controls, engine controls and thrust vector controls. The complex software at the heart of the VMS absorbed a large fraction of development costs, but provides the aircraft with unrestricted 'carefree' handling throughout the envelope, and very high angular rates in manoeuvre. The F-22A uses rudder tow-in to provide the speedbrake function. Aircraft utility systems also saw much innovation. The aircraft uses an On-Board Oxygen Generating System (OBOGS) to provide breathable oxygen, but also cockpit pressurisation and defogging. An On-Board Inert Gas Generation System (OBIGGS) is used to produce nitrogen for fuel tank inerting, and a Halon gas extinguisher system was introduced to protect the engine bays, APU, and most large cavities in the airframe. The Allied Signal Aerospace Auxiliary Power Generation System (APGS) is built around a 450 SHP G-250 turbine APU, considered the highest power density design in production, coupled to a Stored Energy System (SES) using compressed air bottles for self-starting. Avionics cooling in the F-22A also departed from convention, using a liquid cooling system to dump heat out of the core avionic suite, especially the APG-77 radar and Common Integrated Processors (CIP). Polyalphaolefin (PAO) coolant is cycled through the avionics in two loops, then through the air cycle cooler (bleed air driven) and then through heat exchangers in the wing tanks, dumping waste heat into the wing tank fuel. The fuel acts as a heat sink, but itself is cooled by the Thermal Management System (TMS), using an air inlet between the fuselage and inboard inlet edge to dump heat from a fuel system heat exchanger. The fuel system comprises the F-2, F-1A and F-1B forward fuselage tanks, the paired A-2L/R wing internal tanks, the paired A-3L/R centre fuselage tanks, the pair A-1L/R outboard aft fuselage tanks, and optional drop tanks, totalling 36,515 lbs of JP-8 fuel. A refuelling receptacle under clamshell doors is used. The 270 Volt DC electrical system is powered by two 65 KiloWatt generators, and a redundant 4,000 psi hydraulic system is used. A retractable arrestor hook was included for short field recoveries. The forward fuselage module is built mostly of composites and aluminium, and is structurally built around chined composite side beams and upper longerons. The clamshell canopy uses a single piece Sierracin 0.75" thick polycarbonate canopy, designed with Zone 1 optical quality through the full field of view. An improved ACES-II ejection seat is used. The cockpit uses six full colour AMLCD multifunction displays, the Primary Multi-Function Display (PMFD) being 8x8", the three Secondary Multi-Function Displays (SMFDs) being 6.25x6.25", and two Up-Front Displays (UFDs) being 3"x4" in size. A GEC Head Up Display is used. The pilot is equipped with an integrated breathing regulator/anti-g valve (BRAG) controlling air to the mask and the G-suit, the latter acting as a partial pressure suit at high altitude, and including an integrated air-cooling garment. Full NBC capability is provided. The low observable composite radome covering the APG-77 phased array is one of the most sensitive - and expensive - components in the forward fuselage. The APG-77 itself with cca 1500 X-band active solid state TR modules is the most powerful and sophisticated radar ever installed in a combat aircraft, providing conventional weapon modes, LPI modes, and an ISAR capability to image the shape of a target aircraft to facilitate early recognition in combat. The forward fuselage includes structural provisions for growth in the radar via paired sidelooking phased arrays. Processing for the baseline F-22A's APG-77 was performed in a package of up to three Common Integrated Processor assemblies - built around the Intel i960 chip and VHSIC arrays. Full production aircraft will use COTS technology processors, reflecting the obsolescence created by politically mandated production delays. The mid fuselage comprises three modules, and is the structural core of the airframe. It contains the two main fuselage weapon bays, the side weapon bays, much of the fuel storage, the APU, the 20 mm M61A2 gun, the main gear bays and the inlet tunnels. Serrated upper fuselage doors are used to dump excess air from the inlet subsystem, and an APU exhaust and inlet are mounted at the left wing root - the gun occupying that volume in the right wing root. The aft fuselage mounts the engines, TVC nozzles, and tail surfaces. It has the highest fraction of structural titanium alloy, at 67 per cent, 25 per cent of its weight being in the lightweight high strength paired electron-beam-welded tail booms. The vertical tails use composite rudders, skins and edges, and HIP titanium castings in the actuator. The stabilators are largely honeycomb, but using composite edges, and a unique lightweight composite actuator shaft. The wings of the F-22A were no less innovative, and aerodynamically optimised for supersonic cruise and high G manoeuvre, but with excellent transonic performance. Structurally by weight the wing uses 42 per cent Titanium, 35 per cent composites and 23 per cent aluminium and other materials. Sinewave spars are used, with 75 per cent of spars composite, and 25 per cent Titanium alloy to improve ballistic damage tolerance. 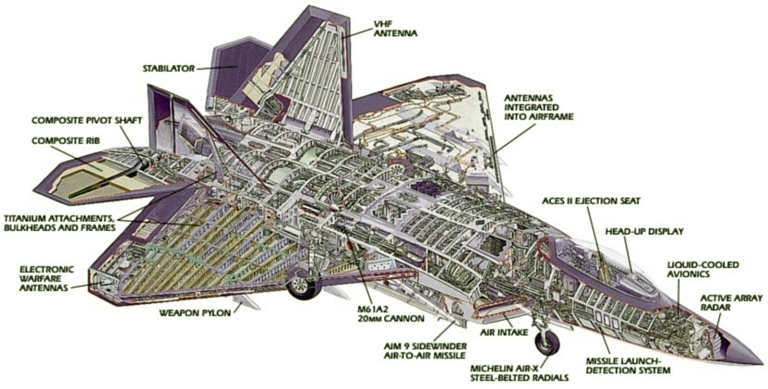 The avionic system in the F-22A accounted for a very large fraction of development and production costs, in a large part due to the first large scale use of active phased array technology in the radar, and PAO liquid cooled avionic hardware - much of the rationale behind the Joint Strike Fighter was to find development investment and production volume to drive down the cost of radar modules, avionic components and engine components to eventually be common with mature production F-22As. The avionic suite is the most highly integrated to date, with virtually all processing performed in the CIPs. The APG-77 radar, ALR-94 Electronic Support Measures system and AAR-56 Missile Approach Warning System are departures from classical 'federated' architecture avionics. Optical fibre links are used to significantly increase data transfer rates between the radar's high frequency components and the CIPs. The baseline F-22A was to have included an advanced long range longwave Infrared Search and Track sensor, but this was removed in the interim as a cost saving measure. Navigation reference is provided by redundant Litton LN-100F ring laser gyros and a GPS receiver. An ALE-52 dispenser for expendable countermeasures is located under doors, forward of the main wheel wells. As a 'software centric' system with millions of lines of code, the F-22A introduced the concept of a system where virtually all functions and processing were built to rapidly evolve by software growth. The pilot of an F-22A was presented with a level of cockpit automation without precedent: sensor modes, such as radar, were automatically chosen by software, hiding complexity from the pilot. The aim was to free the pilot from the mind-numbing information saturation problem seen in most contemporary combat aircraft. The combination of the LPI radar and passive ESM provides an autonomous long-range detection footprint larger than that of any contemporary combat aircraft. A new LPI Inter/Intra-Flight Data Link (IFDL) was included to permit flights of F-22As to transparently exchange data in combat, including fuel states, weapons remaining, and targets being engaged. There can be no doubt that the F-22A will remain the pinnacle of modern fighter technology for decades to come. The F-22A has transitioned from LRIP to full rate production, incorporating a range of enhancements developed during the latter phase of the development program. An extensive roadmap now exists for future incremental upgrades (Author). 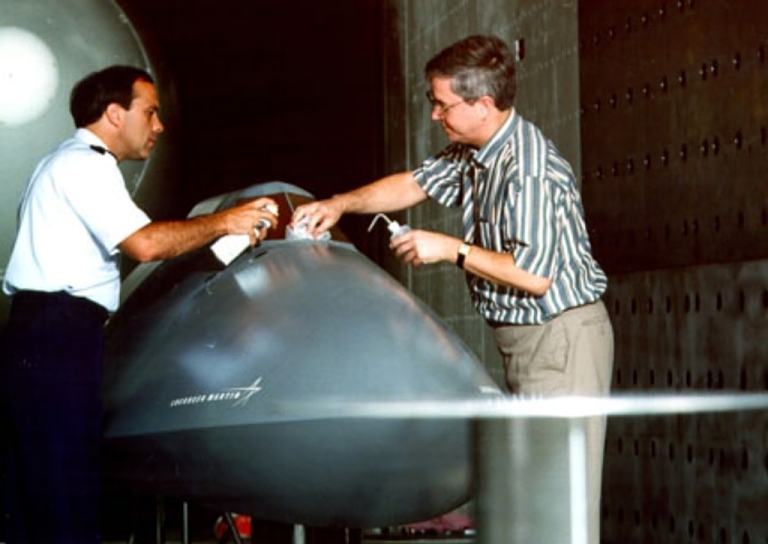 Wind tunnel testing of a stealthy external stores pod, designed to carry weapons such as the GBU-39/B and GBU-40/B Small Diameter Bomb. The pylons are rated for 5,000 lb stores (US Air Force photo). Technicians at the USAF AEDC perform low observables testing on an electro-optical sensor fairing, developed for the AIRST sensor. Any EO sensor upgrade would exploit this earlier effort to minimise risk and cost (USAF Photo). The baseline F-22A Block 10 will be capable of air superiority, air defence / cruise missile defence and deep-penetration strike roles. Subsequent Block 20, 30 and 40 configurations will progressively expand air to air and strike capabilities, and exploit the aircraft's survivability to perform ISR roles. The F-22A thus becomes the 'broadest' multirole fighter in service (Author). 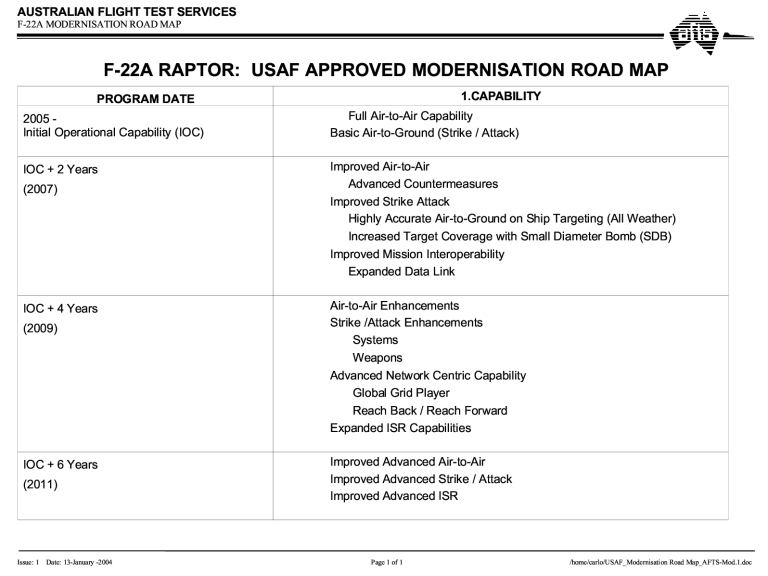 Much of the public literature on the Raptor reflects the baseline configuration, largely frozen during the late 1990s to comply with congressional cost caps on the development program. Unfortunately, many observers have not bothered to explore more recent disclosures detailing ongoing evolution of the design. The ability of the F-22A to penetrate all conceivable air defences unchallenged led to a progressive role toward strike, especially strike against high value targets and surface-based air defences. This parallels the evolution of the earlier F-15 into strike roles with the F-15E ‘Strike Eagle’. Longer term, the F-22A was expected to replace the F-117A in its penetration role. By late 2002 it was clear that the F-22A was more the multirole fighter in future tasking than the air superiority fighter it was conceived to be. As a result, in September 2002 Chief of Staff General John P. Jumper announced the redesignation of the F-22A as the F/A-22A. In 2005 this was reversed by incumbent Chief of Staff General Buzz Moseley, who observed that by then the F-22A had become widely accepted in the US as a strike aircraft. The baseline weapons payload of the F-22A in air superiority roles comprises a pair of AIM-9X WVR AAMs in the side bays, and six AIM-120C variant BVR missiles in the main fuselage bays. For 'unstealthy' air defence roles such as bomber and cruise missile intercept, an additional four AIM-120 could be carried on external pylons with a pair of external tanks. The pylons are all rated to 5,000 lb and can be jettisoned to regain full stealth performance. With four full external tanks carried there is little degradation in load factor or roll rate performance. The Initial Operational Capability configuration, fielded in 2005, was already multirole, with the option of four AMRAAMs being replaced by GBU-32 JDAMs. This provided an analogous deep-strike capability to the F-117A, but much more survivable. Current planning envisages the introduction of the GBU-39/40 Small Diameter Bomb in the Block 20 aircraft by 2007, together with high resolution SAR radar modes, improved radar ECCM, two way voice and data MIDS/Link-16 capability, improved crew station software, and improved electronic countermeasures. The Block 20 configuration is the baseline for the Global Strike Task Force (GSTF) fleet, and will include JSF common radar modules, a dedicated high-speed radar processor, and COTS technology CIP processors. The Block 30 configuration, planned for 2008-2011, extends the growth seen in the Block 20. Side-looking radar arrays are envisaged to provide a significant ISR capability in the aircraft along with enhancements to provide full air defence suppression (Wild Weasel) and time-critical target engagement capabilities. A Satcom terminal will be added to provide continuous network connectivity during deep-strike profiles. The post-2011 Block 40 aircraft is intended to be the definitive Global Strike configuration, including incremental enhancements to Block 30 additions, to provide full sensor networking, range enhancements, highly integrated ISR capabilities, and a Helmet Mounted Display similar to the JSF. Longer term planning for post Block 40 envisages an Electronic Attack variant, essentially replacing the lost EF-111A Raven. 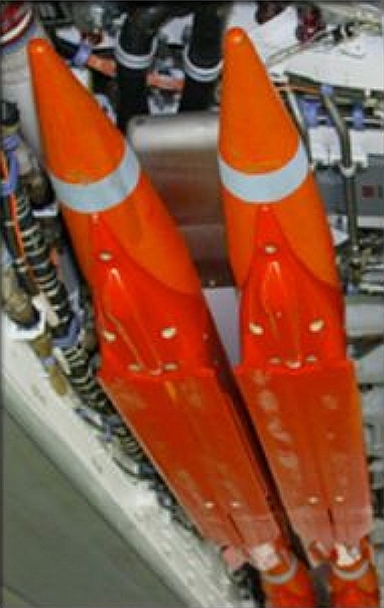 A stealthy stores pod for JDAM and SDB was also in development to enable carriage on external pylons. 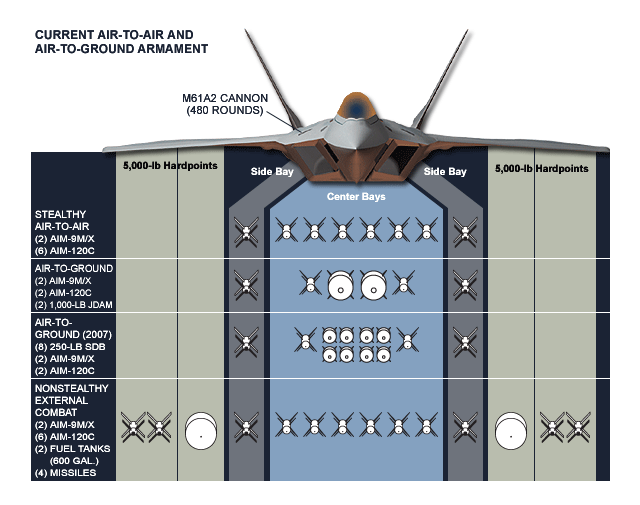 As a strike aircraft the F-22A will have similar internal payloads to the JSF, but will be vastly more survivable due to better stealth to evade air defence missile batteries, plus better speed/altitude performance, more internally carried defensive air-air missiles and the ability to kill opposing fighters with no difficulty. The spiral development program for strike capabilities is incremental, and primarily involves software and integration of networking equipment and new weapons. As a result, it is an very affordable proposition. The Block 20 enhancements were covered within the original 2004 production budget. 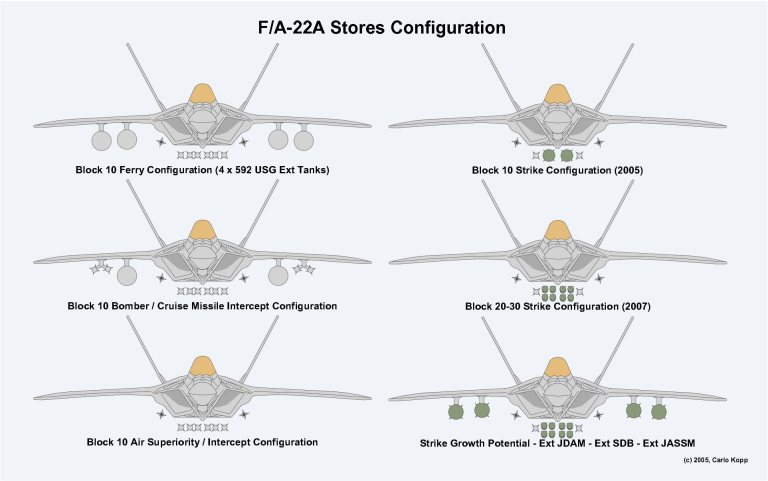 Concurrent with F-22A evolution, the FB-22A is being explored as a parallel strike platform for the US Air Force. The most recent reports indicate that the configuration of the FB-22A has shifted from a pure delta design, to a configuration similar to the F-22A with an enlarged wing, enlarged weapon bays, and stretched forward fuselage accommodating a second crew station. The F119-PW-100 engine would be enhanced to permit long-duration supercruise on deep-strike profiles, with specific optimisations in a number of areas for this purpose. Perhaps the most visible change in the region following the end of the Cold War has been the proliferation of large ‘high capability’ category air superiority fighters. This chart illustrates which types have been acquired or deployed by regional nations. Australia currently operates the smaller ‘low capability’ F/A-18A and plans to acquire the small ‘low capability’ Joint Strike Fighter. This places Australia firmly in the same force structure planning bracket as Taiwan, Bangladesh and New Zealand. 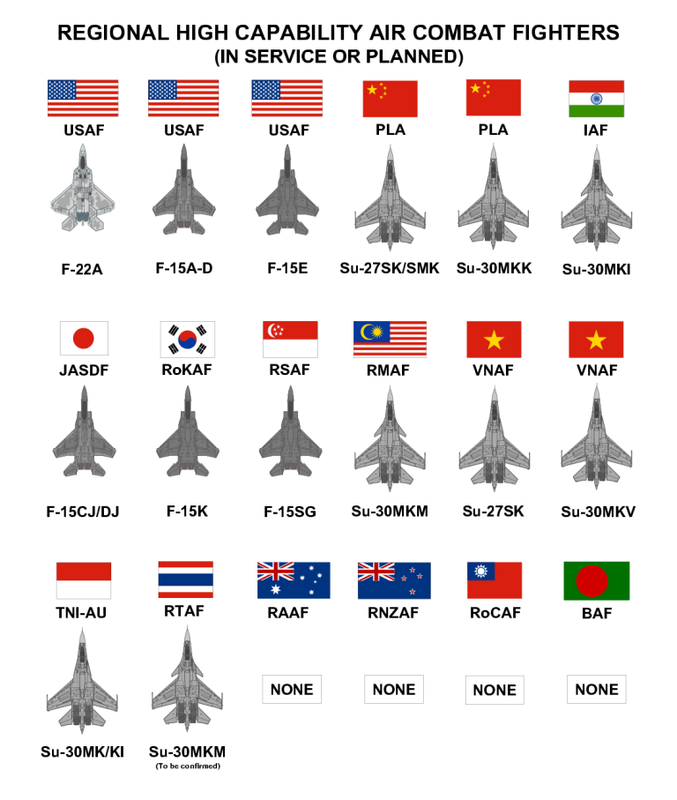 This division of fighters into ‘high capability’ and ‘low capability’ categories is based on the United States Air Force ‘High - Low Mix’ model, abbreviating the more formal ‘high capability and performance category’ and ‘low capability and performance category’. 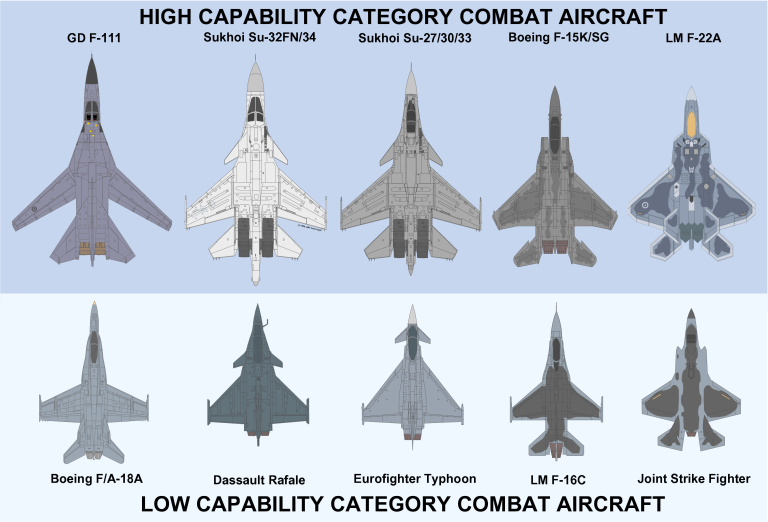 Examples of the ’high capability’ category include the F-14, F-15 and F-22, examples of the ‘low capability’ category include the F-16, F/A-18 and planned Joint Strike Fighter. (C. Kopp). 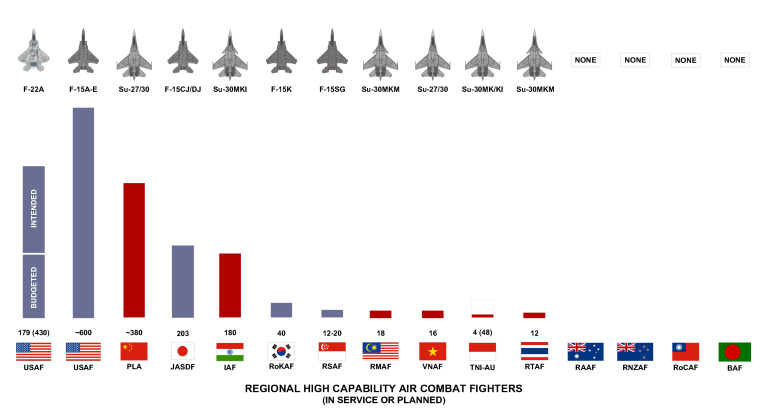 This chart displays currently planned numbers of high capability category air combat fighters to be deployed by regional operators. Final numbers of the Su-27SK, Su-27SMK, Su-30MKK, Su-30MK2 Flanker B/G and derivatives remain to be determined, and Russian sources claim that in excess of 500 aircraft could be acquired by China alone. Taiwan has actively sought mothballed US F-15 fighters, but the US has not agreed as yet to provide the type. Australia, New Zealand and Bangladesh, uniquely, have no intent to deploy high capability category air combat fighters (C. Kopp). Since 1991, the world strategic environment has changed dramatically. 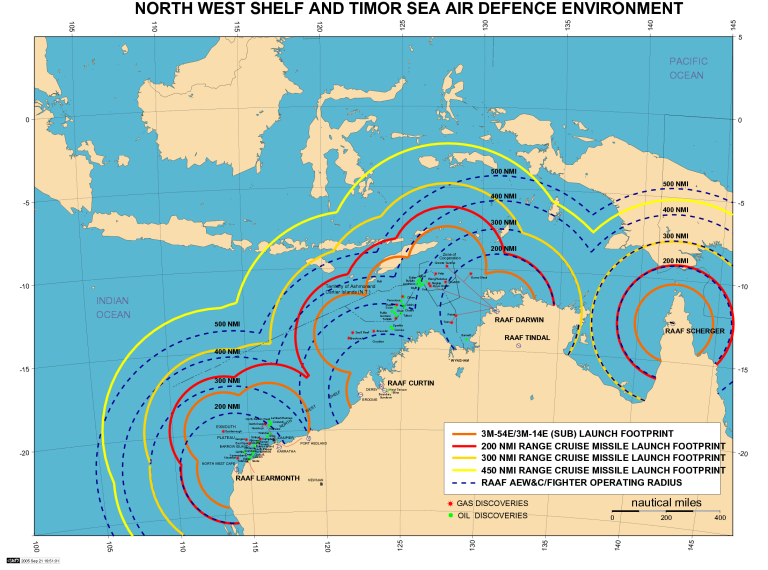 While most media and political attention remains focused on the War on Terror in the low-tech Islamic world, the larger long-term strategic issue is the ongoing arms race in the Asia-Pacific-Indian region. Within the PacRim itself, the growth of China as a regional military and economic superpower is the single greatest strategic change seen since the fall of the Soviet Union. By 2015 we can expect to see China become the largest single operator of late-generation Sukhoi Su-27/30 derivative fighters globally, flown in a high-low mix with indigenous Lavi-like Chengdu J-10 fighters. By then, the PLA-AF will be operating A-50 AWACS and Il-78MKK Midas aerial refuelling tankers. New-build Badgers, armed with indigenous and likely Russian derived cruise missiles, will replace much of the legacy fleet. If the converging Russian push to export Backfires and Bears meets with the PLA-AF leadership's ambitions to operate these aircraft, China could well end up with a fleet of up to 40 upgraded Tu-22M3 Backfires along with a regiment or more of late build Tu-95MS Bears, all armed with cruise missiles and the latter likely to be mass produced in China. In strategic terms, the PacRim will be faced with a technologically evolved derivative of the very same capability package that terrified NATO planners during the last half decade of the Cold War. With Backfires providing a reach of circa-2,500 NMI, and Bears 4,000 NMI, armed with cruise missiles, there are no nations in the PacRim outside the footprint of the PLA-AF's strategic forces. For the US, with its principal conventional deterrent capabilities in the Pacrim sited at Andersen AFB in Guam, Kadena and Misawa in Japan, and naval CVBGs based in Japan and US PacRim ports, China's growing capabilities will present a genuine strategic challenge. Guam and Kadena fall under the footprint of the Backfire, or refuelled Sukhoi fighters. Naval CVBGs, having lost the A-6E, F-14 and dedicated aerial refuelling tankers, are largely limited in reach without US Air Force tanker support, and by 2015 equipped mostly with the limited F/A-18E/F. The F-22A is the strategically pivotal asset for the US in the PacRim, providing unmatched capability in several areas: the air superiority capability to balance Chinese Flanker numbers, the defence suppression capability to defeat Chinese S-300/400 missile systems, the penetration capability to shut down PLA-AF and PLA-N airfields, and the cruise missile engagement capability to blunt any pre-emptive or sustained strike campaign conducted by a future PLA-AF strike force. The US deterrent posture in the PacRim region will hinge mostly on available numbers of F-22As in this theatre. For Australia, the F-22A continues to represent the single best choice as a replacement new build combat aircraft for the RAAF, as it is the only type which will be strategically credible in the post 2015 PacRim environment. The first F-22A assigned to the 27th Fighter Squadron of the 1st Fighter Wing, Langley, Virginia, the first operational unit to fly the F-22A. The aircraft is flown by Lt. Col. James Hecker, USAF, over Fort Monroe, Virginia, on May 12th, 2005. At full strength the 27th FS will have twenty six F-22A aircraft (US Air Force photo).